Thousands pay homage to the shrine of an assassin and organise a festival on his death anniversary – transforming a murderer into a saint. When Mumtaz Qadri, the man who shot Pakistan Punjab’s governor Salman Taseer 28 times in broad daylight in Islamabad’s posh Kohsar Market in 2011, was executed on February 29, 2016, it was speculated that the government had cleverly chosen that specific date so that Qadri’s supporters would be deprived of the opportunity to commemorate his death anniversary annually. February 29 would, after all, only return every four years, the government would have hoped. In the middle, at least for the incumbent government, there would be relative peace. They couldn’t be more naïve. Instead of a one-day anniversary, a three-day festival was observed this week to mark the first year since his hanging. In an interview last month, Qadri’s father estimated that as many as 4,00,000 followers were likely to participate in the festival. On Twitter, eyewitnesses reported that at least 5,000 to 7,000 followers flocked his shrine on Wednesday, the last day of the festival. Last year Qadri’s death led to a series of protests across Pakistan. His supporters burnt tyres and chanted anti-government slogans. Qadri was proclaimed a martyr. He had already long been declared a national hero, ever since he killed Taseer. 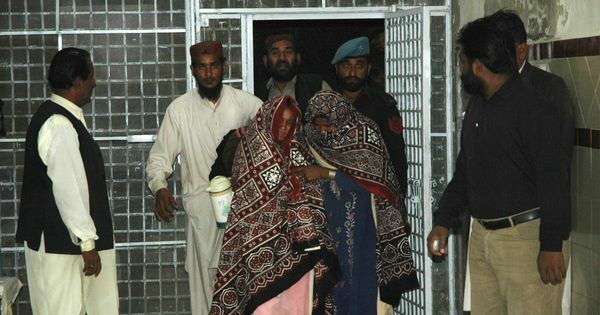 He alleged that Taseer had committed blasphemy for standing up for the blasphemy accused Christian woman, Asia Bibi. When Qadri killed Taseer in 2011, thousands came out in the streets to distribute mithai and garlands for the good deed he had committed. One may think that it were the uneducated, the illiterate and the ignorant that partook in such gross celebrations. The reality is dozens of educated lawyers also came out in his support. 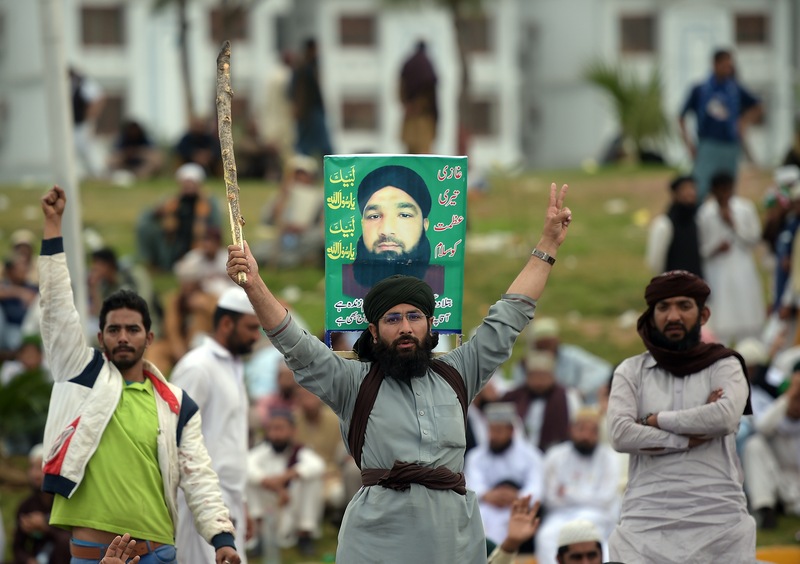 Supporters of executed Islamist Mumtaz Qadri shout slogans during an anti-government protest in front of the parliament building in Islamabad on March 28, 2016. Qadri was compared to Ilm-ud-din, who in 1929 had killed a Hindu publisher for publishing Rangila Rasul, literally translated as the “Colourful Prophet”. The pamphlet offended Muslim sentiments and Ilm-ud-din took it upon himself to punish the culprit. Though Ilm-ud-din was sentenced to death, his followers were bent upon keeping his spirit alive. He was declared a martyr and a ghazi. A mausoleum was built so that people could come and pay their respects and seek his blessings, hoping that they too could walk on such a “righteous path”. Today, Ilm-ud-din’s “heroism” resonates with many Pakistanis – in fact, though the provincial government in Khyber Pakhtunkhwa has revised school textbooks extensively since coming to power and have omitted any non-Muslim role models from the curriculum, the government has ensured that Ilm-ud-din is taught so that his teachings can be entrenched in Pakistan’s cultural memory. Every year, thousands of children memorise his sacrifices in the name of Islam, learning that it is every good Muslim’s duty to pick up arms and murder anyone who offends their religious sentiments. Mumtaz Qadri too is a byproduct of the legendary Ilm-ud-din. He is one of his most successful progenies, garnering the support of tens of thousands. On the first day after his funeral, it is estimated that Rs 80 million were donated to the Mumtaz Qadri Shaheed Foundation. Millions more followed. A shrine has been built where Qadri’s devotees come to pay their respects and seek his blessings – an eerie reminder of Ilm-ud-din’s legacy. 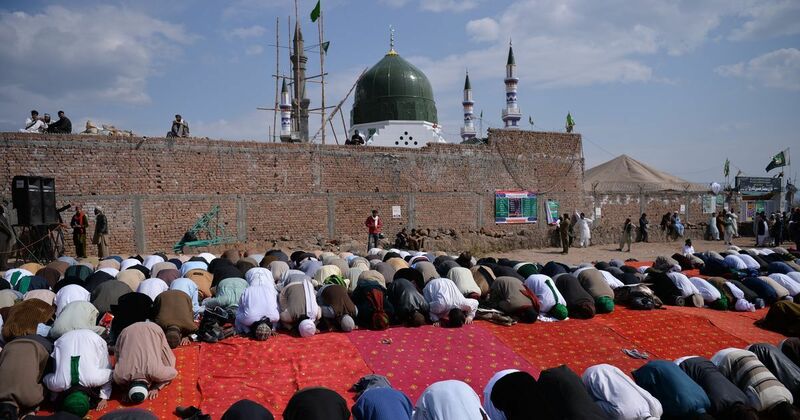 Situated on the outskirts of Islamabad but within Capital Territory, not only is the shrine considered a holy place, the entire area has come to hold spiritual significance. In the past few months, property prices have soared and dealers are using Qadri’s pictures to seduce people into buying land in the vicinity. After all, who wouldn’t want to live in such close proximity to one of Pakistan’s most glorified heroes? It is interesting to note that Qadri belongs to the Barelvi sect of Islam. Traditionally inclined towards Sufism and the practice of shrine worshipping, Barelvis have been viewed as vanguards of tolerant Islam amidst the wave of global Islamic fundamentalism, dominated by the Wahabi movement. In the past few years however, they have come out in hardline support of the controversial Blasphemy Law in Pakistan. It shows that puritanical beliefs are no longer limited to a certain religious group. Extremism has cast a web over diverse religious practices. Whereas death anniversaries and pilgrimages to shrines have usually involved the veneration of peaceful Sufi saints symbolising tolerance and religious syncretism, today thousands pay homage to the shrine of an assassin and organise an “urs” – death anniversary of a Sufi saint – transforming a murderer into a saint. 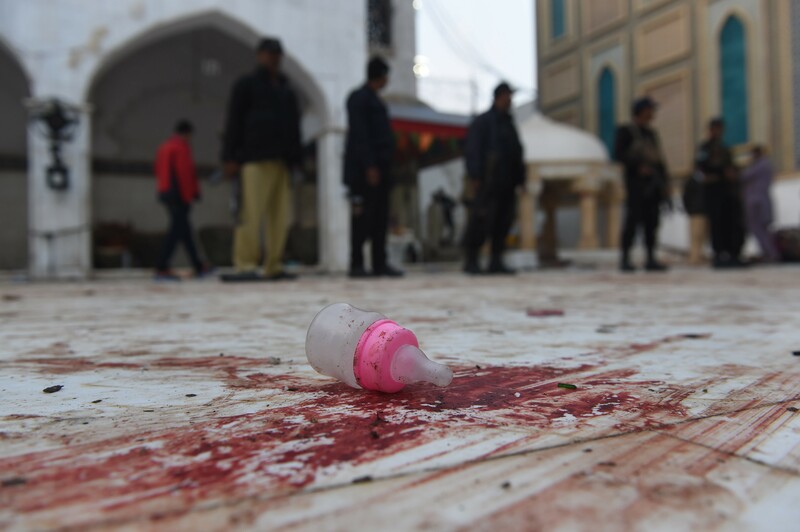 In the wake of one of the bloodiest attacks on a Sufi shrine at Sehwan Sharif in Karachi, as Pakistan and the world worry that Sufism is under attack, Qadri’s shrine serves as a reminder that perhaps the biggest threat to the country and its syncretic practices is not from ISIS or an external actor but from the poison that breeds within. The government shut down schools and offices this Wednesday to host different heads of states for the ECO – Economic Cooperation Organisation – Conference, trying to ensure tight security in Islamabad given the spike in terrorist acts. As part of this, the government also banned Qadri supporters from marching from Lahore to Rawalpindi and protesting against the death of their leader. The government was afraid that the protestors might turn violent while foreign dignitaries were in the country. Yet thousands turned up at his shrine this Wednesday to commemorate his death, singing songs and chanting praises. The government turned a blind eye to this, just as it turned a blind eye to the millions that poured in in the form of donations for Qadri’s foundation and led to the construction of his shrine. The fact that the shrine stands tall within Capital Territory, shows that either the government does not see the glorification of assassins as a threat or that it is incapable of taking action, fearing public outcry from Qadri supporters. To close one of the most violent months in Pakistan with the perverse idolisation of a killer embodies the terrifying state of affairs where weak governance structures are clashing with increasingly powerful non-state actors. Though the government has started to take action, for instance with the arrest of Hafiz Saeed earlier this year, one can only hope that it isn’t too little too late. Anam Zakaria is the author of Footprints of Partition: Narratives of Four Generations of Pakistanis and Indians.